Photo by Meg Pittelko. Andreas Hobbelstad and Kjetil Normand host “Seriously Norwegian” on KORD radio. Kjetil Normand and Andreas Hobbelstad host the show “Seriously Norwegian” on KORD Radio. But they are not your average Cobbers – Hobbelstad is from Hokksund, Norway and Normand is from Jessheim, Norway, but both students attend school in Hamar. They are studying at Concordia for the next year and, whether they are discussing crazy happenings in their day or how different life is here compared to Norway, Normand and Hobbelstad provide an ab-workingly hilarious show on Friday evenings at 8 p.m.
On the show, Normand and Hobbelstad play a variety of Norwegian music ranging from top hits to their favorites. They also post pictures on the show’s Facebook page that relate to the topics covered in the show. For example, toilets were the topic on a previous show, and a photo of a man’s basement that was filled with sewage after the neighboring building’s sewer backed up was posted last week. “‘Seriously Norwegian’ is the show to listen to,” Normand said. When comparing Norway to the United States – beyond the language – how we communicate is probably the largest difference. In casual conversation, for example, Americans may just say, “Hey, what’s up?” and barely (if at all) get a response. However, in Norway, such a questions is usually followed with a twenty-minute conversation. Hobbelstad and Normand said that they are still adjusting to this difference, but that it is only one of the many differences between cultures. Despite these differences, Normand explained that it can be difficult to find topics to talk about each week. “Norway can be boring,” he said. There are countless differences between Concordia’s campus and their college in Hamar, Norway. They compared their whole campus as being equivalent to the Knutson Center in size. Normand also said that the relationship they have with professors is much more casual. Yet, the main concept that Hobbelstad wants to convey is that Americans don’t know much about Norwegians. “We don’t eat lutefisk and lefse all the time,” he joked. 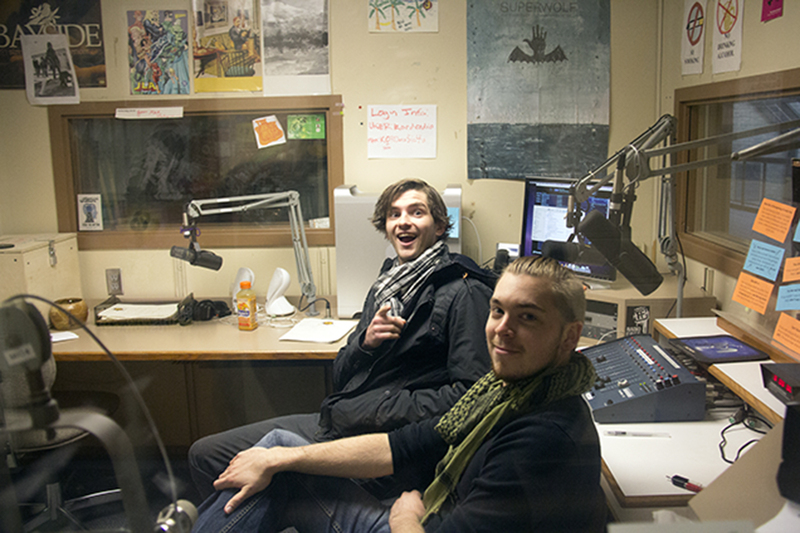 The “Natch Habby,” another show on KORD Radio, airs on Tuesdays at 11 p.m. Sean Hughes and Jason Finnerty, two international students from Ireland, and an American, Jacob Olson, host another comical KORD radio show. In fact, if not for their American friend, the Irish wouldn’t have a show at all. Both Hughes and Finnerty can attest to this statement. Although Olson didn’t even consult the two until after he booked the time slot, both students eagerly jumped on the opportunity presented by their friend. Live music by Hughes is featured on the show from time to time. The show itself also plays “real Irish music,” because the students explained that the American version is just not quite the same. Typically, they only play three or four songs because they end up talking for a majority of their allotted time. Even though they don’t always know what they are going to talk about before they get there, they always manage to fill the silence. “After the show is finished, we sit around thinking ‘I wish we could have talked for longer,’” Olson said. When Hughes and Finnerty were asked what makes their show special, they laughed and asked in return, “Is it special?” They said, instead, that it’s very casual and that they talk mostly about their views of America and American customs. “The accents make the show,” Finnerty said. Hughes and Finnerty talk in their Irish dialect on the show, and they have a lot of fun. They take a number of pictures and record videos in-house, which are then posted on Facebook. The trio mostly talks about the many differences between life in Ireland and life on Concordia’s campus. Like stereotypical Irishmen, they miss their Irish food – mostly potatoes. “Have I mentioned the potatoes?” Finnerty asked for the tenth time. He went on to say that he normally eats supper at 2 p.m. and drinks tea or maybe eats a sandwich the remainder of the day. But, beyond the food, the United States’ need for a drive-thru for everything baffles both Finnerty and Hughes. For instance, he offered, when checking out at a grocery store, the cashier greets the customer and asks them how they are doing. This concept is odd compared to their culture back home. Although their accents may draw viewers to the show, Finnerty explained that Olson is the QB [quarterback] of the Natch Habby. “We’re just the water boys,” he said, motioning to Hughes and himself. They jokingly decided that Olson runs the show, and all that they have to do is show up. Ultimately, all of these guys have a great time hosting their shows for KORD Radio. If you have questions you would like them to talk about during their show, post them on their respective Facebook pages “The Natch Habby” and “Seriously Norwegian,” and don’t forget to tune in!